Did you see this photo last week? 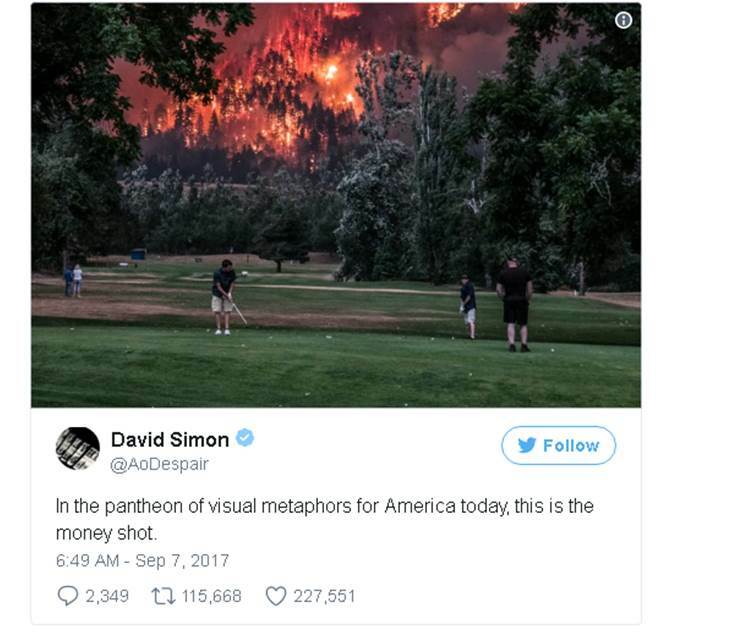 Golfing at the country club while the forest burns behind you. Yep. And this is exactly how I felt about myself yesterday as I sat on the sofa shoveling ice cream into my mouth while remotely tracking two of my friends who were competing in the Ironman Wisconsin. She just completed mile 62 of the bike portion? Wow! Slurp. Slurp. Her half marathon time is better than mine, even after swimming 2.4 miles and biking 112. Wow! She’s so amazing! Slurp. Slurp. I was so impressed that two of my friends had done the work required for an Ironman and were now fearlessly competing. That was awesome. The correct thing to do here would have been to become insanely motivated and head out for a sweat session of my own, running in solidarity, but I did none of that. I stayed on the couch. Earlier this year, I set a personal goal to train for and set a PR in a fall marathon. I had my sights set on the Twin Cities Marathon (October 8th), with the secret dream to stay in good enough shape to consider tacking on the 25th Anniversary of the Walt Disney World Marathon in January. These are both races I’ve done before and love. Through the end of July, I kept up with my training fairly well. At that point I was commuting up to three hours a day, but I still found time to get in the weeknight runs as well as the longer ones on the weekends. In the week before we moved, I completed a 15 miler. It wasn’t pretty, but I did it. And then came the move. The first week, I missed three training runs during the weekdays but was able to complete my longer run (13.1 miles, it was a drop-back week) on Saturday. The second week, I missed the weekday runs and the long run. I started to panic. I didn’t know routes, directions or water stops in my new neighborhood. I doubted the safety of running alone. It was hot. I made the lame excuse-ridden decision that this was not my year, and called it quits on the marathon plans, but I really let myself down. Compounding that is the fact that while I changed my exercise patterns, I sure as heck didn’t change my eating. Frankly, the move has opened up a Pandora’s Box of great new restaurants to try in person or via delivery. There is even a liquor store that delivers through Amazon Prime’s two hour service to my house, which just sounds like the most dangerous thing ever. (I haven’t sunk quite that far). Which brings me to the title of this post: Tucker Dress Inspiration. Tucker is a NYC-based company that makes feminine, pretty clothes. They are also very expensive. While I love to spend money, it is hard even for me to justify buying a blouse that is almost $300. Except – I have a work conference coming up next month, and the combination of my lifestyle factors (M&Ms, I’m looking at you) and job switch (moving from all suits/all the time to more business casual or even – yikes! – scrubs) has left me with limited wardrobe options. And of course I want to look good. 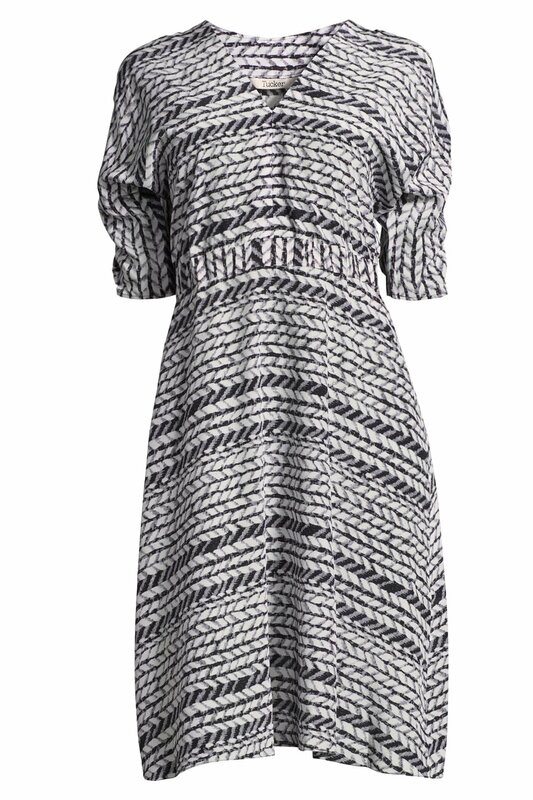 The top one is called The Market Dress in Black Tire Track. It’s silk and retails for $375. 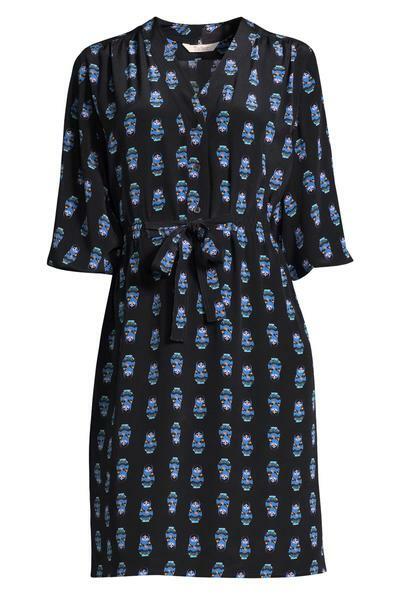 The bottom is a fun Russian Dolls print. The style is called “Abigail’s Party Dress” and it retails for $355. Tucker’s website styled it well for fall with black tights and boots. It looks adorable. The real kicker? Both of these look like they *may* be forgiving of my recent indulgences. I might have to find out. Awesome for your brother, cousin et al! What a huge achievement. Miss you!